Some of the most knowledgeable people in the Human Kingdom are Scholars. Having spent their live in the City of Knowledge, they practice magics and studies both and work to further their knowledge of the world. 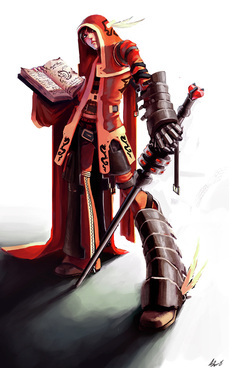 Scholars have positions within the Army of the Kingdom as spellcasters and healers, a position not able to be filled by anyone else. Scholars are well funded by the Kingdom, and many believe much of this money goes for lavish homes for every scholar. The opposite is actually true; Scholars prefer to live in simple homes, and donate much of their money to the people who reside in the City of Knowledge. There are two ways that a Scholar can follow, the Path of Magic and the Path of Knowledge. Each one has its own unique benefits, giving them specialities the other does not.